Instaflex - Good Results, but you need more than a trial! I ordered the $4.99 special, but didn't think it worked.....when I called to cancel, they said you may need a longer trial, and sent me another sample at no cost, my boyfriend, a physician, told me to try it for two months!...He was right!...I am in no pain from my joints, and am 85% better!.....I am very happy with the results, but you need to be on this for a couple months to see a great difference! 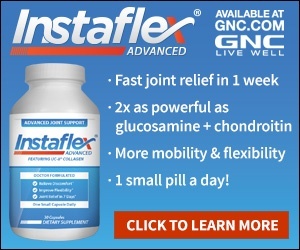 BTW, ordering another bottle of Instaflex only cost me, I believe $37 direct from the company, not what some of the local stores are charging. I am not a fan of buying online, because of the fact that they often put you on automatic refill, but you need to be cautious and ask about this when you order. Review #518548 is a subjective opinion of User518548.